The Chicago Blackhawks agreed to terms on a one-year contract with St. Cloud State's Drew LeBlanc on Friday, the same day the forward won the Hobey Baker Award given to the nation's top college hockey player. LeBlanc had 13 goals and 37 assists in 42 games this season with St. Cloud State, helping lead the Huskies to their first Frozen Four appearance. He is the first player from St. Cloud State to win the Hobey Baker. LeBlanc, a fifth-year senior center, was seventh in the nation with 50 points. He was a two-year captain for the Huskies, who lost 4-1 to Quinnipiac on Thursday in the national semifinals. 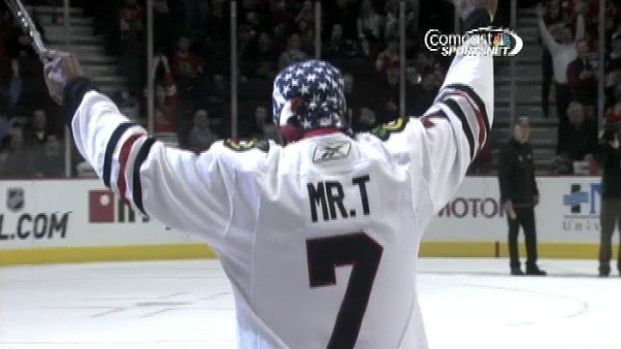 Mr. T took to the ice for a "Shoot The Puck" promotion during intermission of the Chicago Blackhawks game at the United Center. The outcome? Obvious. Nothing but net. The native of Hermantown, Minn., was named first team all-conference in the WCHA this season.